I was really looking forward to seeing this movie. I loved the book and was hoping for a good YA book to movie adaptation seeing as some of the recent ones haven't been that great. 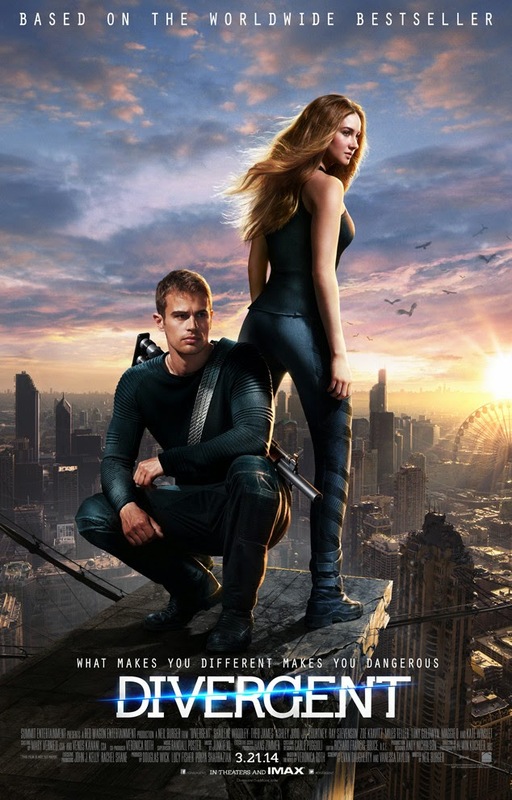 DIVERGENT met all of my expectations and passed them! This was by far one of the best movie adaptations I've seen in a long time! Shailene Woodley captured Tris perfectly! I was so ready to hate her I wasn't a fan of her casting but girlfriend proved me wrong! And peeps lets talk about Four! Theo was perfect.... Wait I drifted off there for a second daydreaming about his shirtless scene and those tattoos! He was another casting choice I was iffy on seeing as he's older than Four but he was perfection! The rest of the cast was amazing as well! I really loved Jai Courtney he was a perfect douchebag Eric and Miles Teller was an awesome Peter I hated him so much! And I loved Kate Winslet, Maggie Q, and Ashley Judd! Ooh and I found Veronica Roth she's in a small scene that is full of awesome! Ok done with my ramble just trust me peeps go see this move on Friday!!! YAY for a good adaptation finally! I'm hoping to get to see it with one of my friends that has also read the books! In its sledgehammer metaphoring and scrappy, eager-to-please charm, it's easy to warm to this latest fantasy teen adaptation.